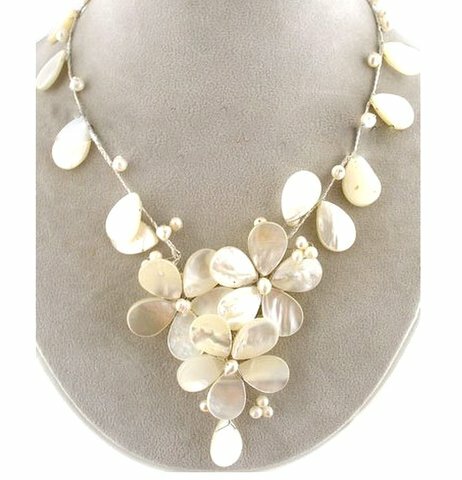 Beautiful Genuine Mother of Pearl and Fresh Water Pearls hand made with fine wire and creme colored string are designed carefully to create an amazing bouquet of flowers. Necklace measures 15" plus a 2" extension. We carry extensions to add on if it needs to be longer. Petals measure approximately 5/8" - 3/4" (18mm) in length. Due to the natural nature of shells, each necklace varies in color and look slightly.